Want to go for a ride on retro-style scooters through the most beautiful corners of the Crimean peninsula? Now you can. Editor’s note: A little over a year has passed since a referendum was held on Crimea, which led to a treaty being signed between the peninsula and Russia. This has been the source of enormous controversy between Russia, Ukraine and the West. Many foreign embassies warn against travel here. As a result of economic sanctions that were passed in response to this event, travelling is not easy in Crimea: almost no international airlines land here and visitors must bring fistfuls of cash with them. Bankcards and credit cards are not accepted anywhere, although it is possible to change foreign currency in banks. Tourists from around the world flock to Crimea every year. They come for the bright southern sun, the scent of pine, lavender and the salty sea, the carved rocks and secret bays, ancient history, mystical places and distinctive architecture. It has now become possible to visit every major attraction the peninsula has to offer in just two weeks, participate in informative tours and quests, all while spending only $300. The ‘Tour de Crimea’team shows how. Daniil Antonov, Ildar Iskakov ​and Irina Ryzhova, organizers of the scooter marathon ‘Tour de Crimea’, have assembled teams of romantics craving complete freedom of movement and independence of thought, who shun the usual boring hotels and scheduled holiday lives. ‘Tour de Crimea’ was born from the initiative of close friends and adventurous travellers. 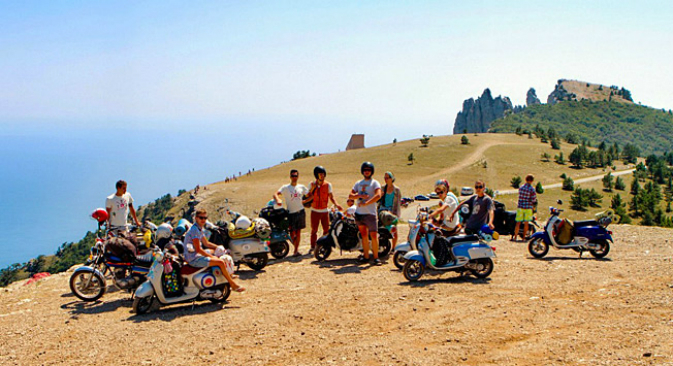 In 2008 Daniil Antonov decided with a group of like-minded people that Crimea was a wonderful place to travel around on retro scooters, and they hit the road. Since then the adventure has been replicated every year and has now even gained the status of an unofficial festival on wheels. Today the global mission of Tour de Crimea is to show sides of Crimea that they have never seen before to travellers from across the world, with the wind in their hair and the hum of engines whistling through their ears. I didn't know what to expect from Tour de Crimea and was a little worried about not speaking Russian and travelling in a group. Usually I travel by myself, without a schedule and I'm very attached to my freedom, but TDC is a perfect way of travelling in a group I think. You have a lot of freedom, there are plenty of people to talk to and the schedule is very relaxed. To my surprise, a lot of people spoke very good English. I liked the atmosphere and made some very good friends who I will definitely see again soon! TDC also made me fall in love with motorcycles. I don’t have a license, so I had to ride with others, but I learned a lot about them. I especially loved camping on beaches and being out in nature. My favorite moments were the evenings around the campfire when people would play guitar and sings songs. I hope I can join TDC again next year, this time with a license to drive a scooter. Is Crimea’s economic integration with Russia complete?